Xiaomi Inc. is a privately owned Chinese electronics company headquartered in Beijing. It is the world's 4th largest smartphone maker. Xiaomi designs. Buy Xiaomi’s new POCO F1 at the low price and high-end processor. 20MP front camera, 4000mAH battery, Snapdragon, 8GB+256GB. 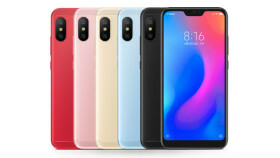 Get the brand new Mi A2 from Mi online store with discount price. Comes with dummy screen protector. Sticks Firmly on the glass display. High light transmission, maximum clarity. Cashback shall mean Rs 2200/-, which shall be credited in the form of 44 cashback vouchers of Rs 50/- each, in the MyJio App of an Eligible Subscriber upon performing Recharge on the Eligible Device. Double Data shall mean double the 4G Data Entitlement in the form of an additional data voucher which the Eligible Subscriber is entitled to a recharge of prepaid plans of RJIO of Rs. 198/- or above. Eligible Device shall mean all variants of Xiaomi Redmi Note 5 & Redmi Note 5 Pro device purchased on or after 22nd February 2018 and which has been activated on the RJIO network for the first time, by an Eligible Subscriber, by performing Recharge. The offer is applicable only on the Indian version of Eligible Device. Cashback Entitlement Period” shall mean the period between 22nd February 2018 and 31st May 2022. Recharge shall mean a recharge performed of Rs.198/- or Rs.299/- prepaid plans offered by RJIO.